Shockoe specializes in utilizing tools which can most efficiently provide a beautiful experience for a given project. We have a history with cross-platform frameworks, as they can often quicken the development period for a mobile app considerably. Many of our projects were historically built on Titanium, and a few more recently were undertaken with React-Native. When Flutter was announced, we knew we had to keep a close eye on it, and we were eager for it to reach the point where it was mature enough to build a robust production app. The results were astounding. 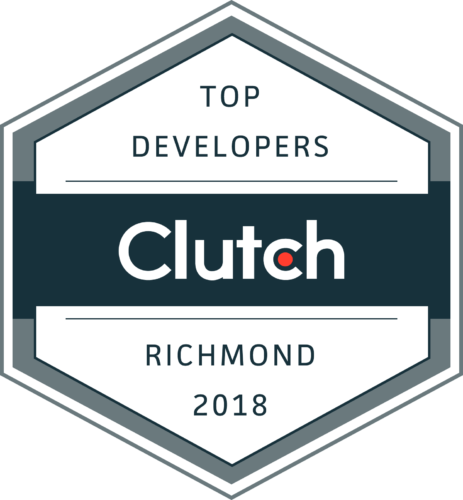 Not only does it ease many of development pains present in other cross-platform frameworks, it also gives you beautiful UI out of the box, and extraordinary speed as it is blazingly fast to develop. In fact, the entirety of the development you will see later in this post was completed single-handedly in a matter of hours! List Convenience: Turning a raw data list of assets and inventory into an actual list laid out on screen couldn’t be easier. It can be accomplished in a handful of lines of code. Beautiful by Default: Apps in this category have a heavy focus on functionality. A framework which looks good in its most basic state lets you focus on the utility and devote as much time as you decide to enhance UI and delivering the right content. List Performance: Flutter renders every pixel on the screen itself, allowing for a performance unparalleled by other frameworks. It touts its ability to maintain 60fps, and scrolling is buttery-smooth even on massive lists. Empty/Loading State Simplicity: Most screens will be heavily data-driven. In some environments, displaying states like waiting for an API response or failing to connect can become extremely cumbersome. Flutter makes it easy to build a UI which reacts to these in-between moments gracefully. In this post, we’re going to take a look at building an inventory management app and not just the Flutter bit. This post includes a fully functioning Node.js backend as well — ensuring you successfully deliver your message and content to your users. Note: This will not be a step-by-step guide, as that would be difficult to digest at a high level. Instead, we will look at each piece and break down the important components. Our app will handle all of the above. MongoDB will be used to store the data. There is no special setup required, we just load all the items into a collection and later run the Node.js server on the same machine to leverage Mongo’s already exposed localhost connection. Most likely, when building an app of this type, it will be used to access an existing dataset. The data in this example will be a subset of the most popular titles on Project Gutenberg supplemented with Wikipedia details. For our server, we will be using hapi with a few smaller dependencies like the official Node.js MongoDB drive and boom for error handling. Once hapi is installed, we must create our startup file. This will get the server up and running to fulfill requests. Let’s use index.js. This line imports and registers all of the endpoints we define in our second, and final, file: routes.js. We separate these so that the server configuration doesn’t get drowned out by the much larger endpoint definitions. In a more complex app, we would likely want multiple files which logically group endpoints into smaller buckets. Here is routes.js with an example endpoint. Its only job is to export an array of configuration objects. Enter Flutter! When creating a new Flutter project through IntelliJ, a main.dart file is created for a basic sample app which implements a counter. This is helpful when learning, but we need to rip out some of that starter code. Here is a single page app which we can use as a starting point. Now that we’re set up, let’s start serving up data. We replace the example endpoint we defined before with one which returns the full list of books in the database. You may notice async/await syntax. As it is available in both recent Node.js versions and Dart, we will use it throughout the backend and the app. There isn’t too much going on here. We connect to MongoDB, specifically the collection books in the database inventory, and run a find query with an empty filter object (first argument) so that all records are pulled. For cleanliness of data, we project only the properties of a book which we would be interested in when listing them en masse. The first thing we need to define is the representation of a book. We will go ahead and include all fields we need to be known for a book, even though only a few of them will be populated from the results of the /bookList endpoint. /// Creates a Book instance out of JSON received from the API. We will use the “Serializing JSON inside model classes” strategy shown in Flutter’s JSON and serialization guide. CatalogPage is a Stateless widget, because the full screen including the appbar doesn’t need to be re-rendered in the future, just the content. For that, we create a Stateful Widget, called CatalogList, which we will place in the body of CatalogPage. To keep this example concise, network requests will be made directly from widgets. It is better to practice to split them out into a non-UI library. Here is Catalog with basic display functionality complete followed by a breakdown below. /// The list of books. /// All books in the catalog. /// Books currently being displayed in the list. /// Kicks off API fetch on creation. /// Fetches the list of books and updates state. When the CatalogList widget is created, we immediately want to fetch the data on all books from the backend. We go ahead and create two list references, one for all the data downloaded and one for data currently displayed, as we know search functionality is coming and we won’t always be displaying the full catalog on screen. When data is first downloaded, though, these will be the same. We take advantage of the fromJSON serialization constructor we created to convert the backend’s JSON response into a list of formed Book objects in one list mapping call. Try/catch around the async body of _fetchBookList is omitted for readability. Make sure to catch possible exceptions/errors in production. Here is where we see Flutter start to shine. To convert this list of Book data into a rendered list on the screen, all we have to do is write an itemBuilder function which returns what a given item in the list will look like, then pass in the list of data and it’s length. We use a Material Design Card containing a ListTile- a prebuilt widget which displays a title and subtitle (and optionally additional inner widgets). That’s all it takes to build a ListView which is ready for production. 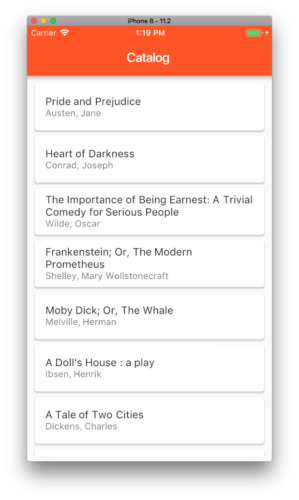 It will lazily render new rows as they are scrolled into view, gracefully handle changes to the list of Books, adapt scrolling behavior to OS, and perform fantastically. Much of the above is styling as well. We could get something functional in half as many lines. When the Catalog List is created, the data list which our ListView is populated from, displayedBooks, is null. Once the data fetch is complete, that variable will point to a valid List. Once this occurs, the ListView can start rendering rows. In the meantime, we need to render something different. If handling moments like these require a lot of development effort, it can feel counterproductive to tackle them right out of the gate while true functionality is still being worked out. This can lead to polish/UX tasks being put on the afterburner. With Flutter, it’s easy to handle loading during our first pass at the screen. We just use a ternary expression in the build function to describe an alternate visual while displayedBooks is still null. Supporting search requires two main changes. /// The controller to keep track of search field content and changes. With the search bar in place, we can register a listener when the CatalogList is created to fire the function which will filter the full book list down to results to be displayed and update state. If the search text becomes empty, the list is set back to the full catalog. /// Performs a case insensitive search. We only pass the id instead of the Book instance, since we will be fetching the book’s most up-to-date full data from the backend when loading DetailPage anyways. We add a new endpoint configuration object onto allRoutes to return full details of a title. It is nearly identical to the full listing except we switch to findOne, add a filter for an id passed from the app, and project additional fields. We also call out to a function to calculate the number of copies available, but we will wait to see that in the Tracking section. The basic DetailPage widget is a bit larger, but most of the functionality will look familiar from CatalogList. This time we make DetailPage itself the Stateful Widget, since we want to allow the AppBar to update with the book’s title once data is loaded. /// The screen which displays the full details of a given book. /// The full book data. /// Fetches the books details and updates state. We could have fetched all these details back on the CatalogPage and simply passed them through the be displayed on the DetailPage. The reason we opt for pulling the data fresh is to ensure we have the very latest details on an item when we view it. In this example, it’s unlikely that any of the fields we are displaying would change frequently. In other industries, however, a DetailPage might be displaying volatile data. These considerations especially come into play when we add our next section. We add two endpoint configuration objects. /checkOutBook will push a name onto the checkedOutTo array, and /returnBook will splice a name out of it. We also add a quick helper method to routes.js to calculate available copies. 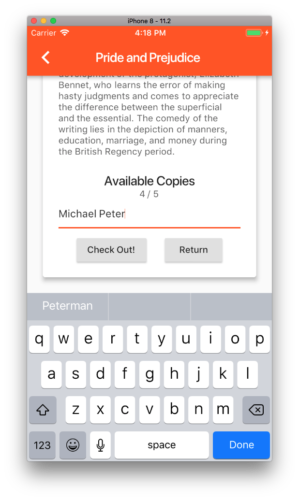 Beneath the other body sections, we add availability details and a small form for checkout/return. Since both actions require the same info, they can share an input box. 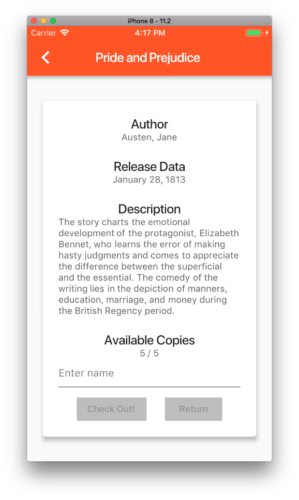 These buttons call functions to pass the current book id and entered a name to the backend, and will update state with the new version of book details returned. This ensures that the available copy count will stay in sync with actions performed. Each button is conditionally disabled by passing null to its onPressed property. Both buttons are disabled by the fieldHasContent flag which is set when the name input field is empty, and the check out button is additionally disabled when there are no available copies. We have a functional, performant, aesthetically pleasing app with associated backend all in ~500 lines of code. Creating a solution for Asset/Inventory Management has never been easier, and Flutter continues to improve daily. Don’t let it’s “beta” tag fool you, Flutter is production ready. In fact, we just built a production Inventory Management application for Belden Brick, so that the brick distributors they work with can access browse their inventory, search products, view product images, order samples, and more! Below you will find the full files from this demo.